The church posts a welcome sign outside, but has Christianity lost sight of reaching the current generation with the heart of the gospel? 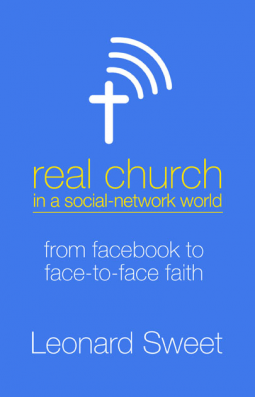 Drawing from years of Leonard Sweet’s paradigm-shifting analyses, Real Church in a Social-Network World delivers ahead-of-the-curve observations and insights into the intersection of the gospel and richer relationships in an ever-changing culture of TGIFers (those who connect using Twitter, Google, the iPhone, and Facebook). This provocative eBook offers practical guidance to leaders and followers, believers and seekers, and anyone who is ready to explore the human longing for relationship.